Is there any work on equality in a market versus friction? This is a question about educational economics. There is a phenomenon when studying countries like the USA and Chile (that have implemented voucher systems) that reducing the friction in a "marketplace" in education (e.g. choosing a school) results in a reduction in equality. It results in stratification of students into schools that match with social class. It seems fairly obvious to me that this is a phenomenon that I'm sure has been studied or talked about in economics in a general way - I just don't even know where to look. I'm looking for research into the idea that where there is some kind of inelastic good (e.g. health, housing, education) then reducing friction in a market will always have an effect of reducing equality. Has anybody studied this? Any pointers to literature? Or if I'm just wrong in my observation of this being "fairly obvious" then I'd love to hear it. Friedman, M. (1962), The Role of Government in Education. In Capitalism and Freedom. Chicago: University of Chicago Press. Friedman, M. and Friedman, R. (1980). Free to choose. New York: Harcourt Brace Jovanovich. Market Structure Makes the Difference. It Helps to Call a Spade a Spade. One Cannot Avoid the Interdependence of School Choice and School Finance, so One Might as Well Enjoy It. School Choice Is More Interesting to People Who Are Puzzled by the Inefficacy of School Inputs. 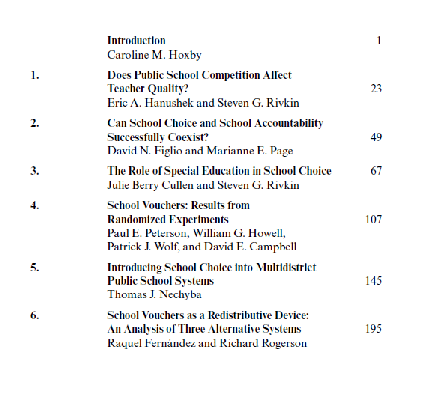 You Cannot Predict the Effects of School Choice on Student Sorting Without the Tools of General Equilibrium. School Choice Will Affect Labor Markets for Educators. 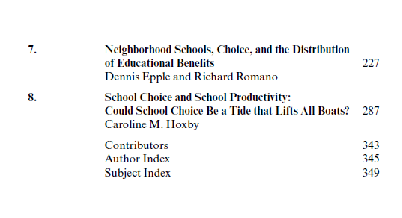 Evidence on School Choice Requires the Latest Methods in Nonexperimental Empirical Analysis. 8.It Is Important to Know Which Students Are Likely to Be Affected by School Choice. School Choice Is All about School Supply. Not the answer you're looking for? Browse other questions tagged reference-request elasticity education-economics or ask your own question. Is there some kind of consensus on the determinant factors of education achievement? Are there any studies that show that “Affirmative Action” hurts the economy? Why aren't there more super-stars in educational content delivery? Is there any good textbook for theoretical economics mathematical modelling? Are there any real world examples of potential Pareto improvements? Are there any experiments about financial games with just one player?